Flowers are an essential element in nearly every wedding. 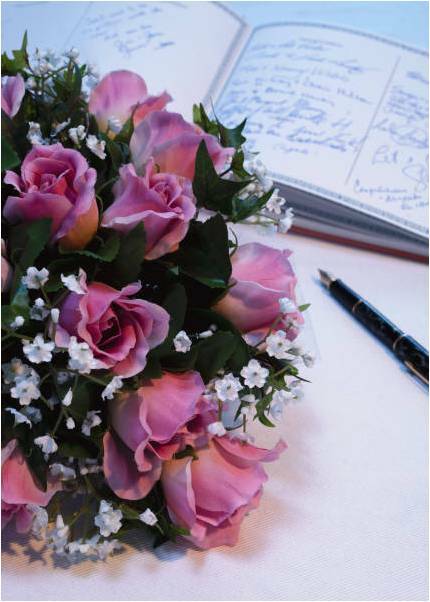 Wedding flower etiquette guidelines exist to help with this element of the ceremony. While modern practical wedding etiquette doesn’t have carved-in-stone rules, the customary guides are helpful in overall event planning and budgeting. Cost wise, tradition dictates that the bride’s family covers the cost of flowers. However, modern couples often opt to share the costs of the wedding between both families. Just remember that whoever covers this expense should take the time to consult with the bride and groom so that the flowers match the wedding theme and colors. Additionally it’s okay to be choosy about the flowers. Whether real or silk, find a floral designer who listens, who has a strong portfolio to show you, and one with whom you feel comfortable. The use of flowers in a wedding is a bit like scenery in a play. If they’re used tastefully and correctly, they frame everything. Too many flowers, however, overwhelm and may cause problems with attendees who are allergy prone. Wedding flower etiquette says: focus on arrangements that fit the size of your venue. You can get much larger gatherings if you’re using a cathedral, for example, because there’s more space and the larger decorations won’t crowd the room. Take care with placement too. You don’t want to block anyone’s view of the bride, groom and wedding party. 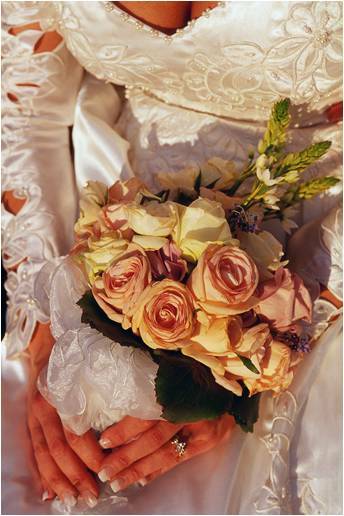 The bride, maid of honor, bridesmaids, and flower girl all customarily carry flowers. There are also flowers needed for the church and reception hall. Get corsages for mothers and grandmothers, and boutonnieres for the groom, ushers and groomsmen. The boutonniere for the best man should be fancier than those made for the groomsmen and ushers. The groom’s boutonniere is, of course, the most elaborate. Similarly, the maid of honor’s bouquet is different than those of the bridesmaid to set her apart, and the bride gets the most elaborate floral arrangement. Corsages, wrist corsages and boutonnieres all go on the left side of the body, to be closest to the heart. In the ceremony, proper wedding flower etiquette doesn’t stop. The flower girl walks down the aisle before the bridal party carrying either a small bouquet or scattering flower petals. Once the bride arrives, the Maid of Honor takes temporary possession of the bride’s flowers while the couple says their vows. Later, at the reception, all bouquets go on the wedding party table as a decorative touch that also indicates the maid of honor without words to those who might have missed the main event. Overall, wedding etiquette isn’t difficult. It just takes a little forethought. Find the flowers that fit your budget and venue, and they’ll make a lovely addition to the whole event.